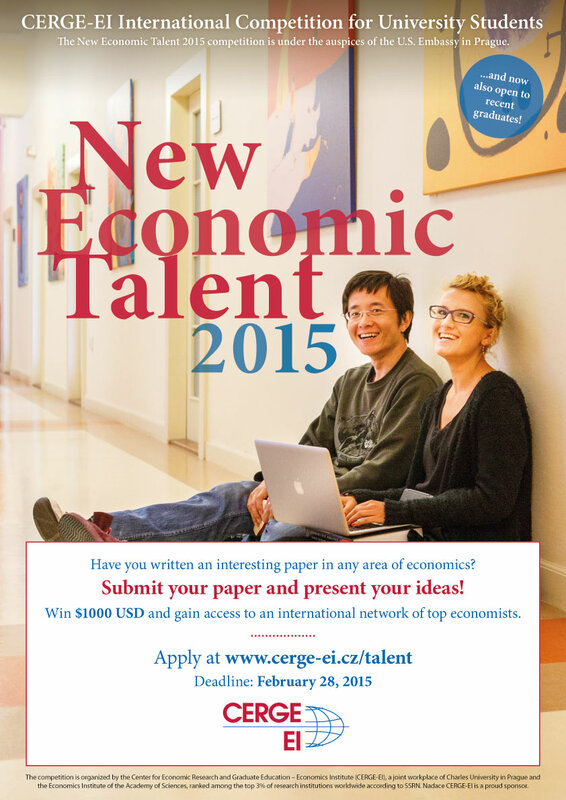 CERGE-EI and Nadace CERGE-EI invite current university students and recent graduates to submit papers to the New Economic Talent 2015 competition. NET 2015 is under the auspices of the US Embassy in Prague. The competition is open to current Bachelor’s and Master’s students (full-time or part-time) or Bachelor’s and Master’s graduates (up to two years after graduation) in any field, who are interested in contemporary economic issues and wish to better understand the forces and processes that ‘shape the world’. We are proud to announce that CERGE-EI doctoral students have taken all three top prizes in this year’s Young Economist of the Year competition of the Czech Economic Society. CERGE-EI students were also successful in 2013. The annual competition, which is organized by the Czech Economic Society, seeks to identify and award the most talented young students of economics. 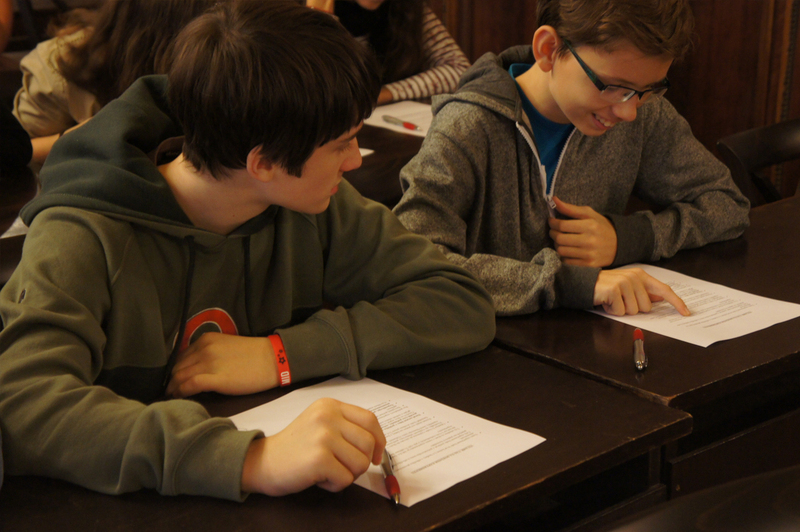 CERGE-EI recently participated in the ‘Week of Science’ (Tyden vědy) of the Academy of Sciences. The Week of Science is the most extensive scientific festival in the Czech Republic with over 500 events and activities across the whole country. CERGE-EI participated in the festival by inviting young Czech students to take part in an economic experiment. The experiment allowed the students to experience the scientific research being done on human decision-making. While in the CERGE-EI computer lab, the students took tests of short-term memory and learned basic information about the significance of short-term memory for everyday life and human intelligence. The second part of the experiment was devoted directly to human decision making, with the students solving concrete logical problems. Subsequently they were presented with the correct solution to the problem and learned about the decision making steps required to reach the answer. The students also got familiar with the concept of the “Keynesian beauty contest,” which illustrates the difference between valuation on the basis of personal preferences and on the basis of perceived popularity in society. The aim of the experiments was to help the pupils understand how experimental economic research is done while also learning the basic role of human decision-making in economic theories and everyday life. Education in economics is one of the least reformed areas in the post-communist world. University classrooms across the former Soviet bloc severely lack motivated and professional economic instructors. Poor instruction engenders future thinkers, voters, and leaders with distorted or no understanding of modern economic principles. Young people are robbed of a quality education that can aid them in thinking critically about the problems facing their societies. This subsequently impedes the prospects for greater openness, growth, and prosperity in this important part of the world. CERGE-EI Teaching Fellowship Program supports dedicated young men and women who enter undergraduate classrooms across the region to teach modern, market-based economics to the next generation. Teaching with novel methods and modern textbooks, fellows introduce new ways of thinking. Beyond their strong impact in the classroom, the fellows demonstrate best practices to other faculty members, raising quality throughout their host institutions. Tomáš Miklánek, a CERGE-EI PhD Student from Slovakia, wanted to make a contribution to the future prosperity of the region and decided to join the Teaching Fellows Program to teach a course. Teaching in the classroom is never an easy thing, but Tomáš had his mind set on an even bigger challenge. Rather than teach in his native Slovakia (or in the Czech Republic, a close cultural and linguistic cousin), Tomáš decided to teach in Voronezh, Russia, a remote city in Southwestern Russia. Why did he choose Voronezh? What experiences and impact did he have there? 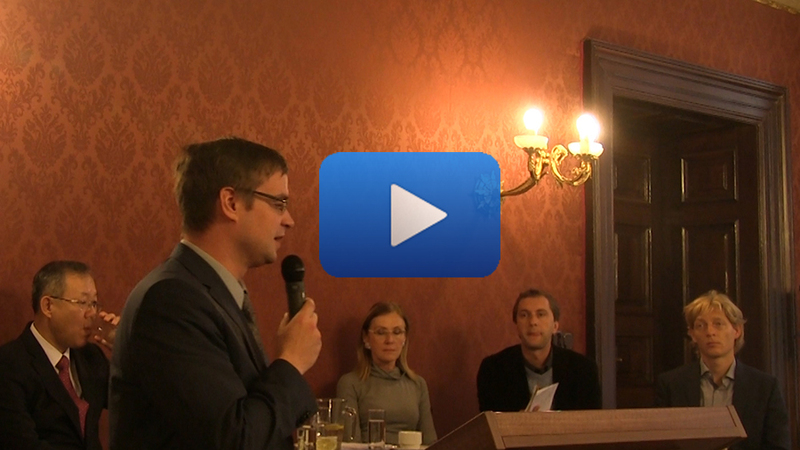 Watch the brief video interview with Tomáš to learn more! Corruption undermines democratic institutions, slows economic development and contributes to governmental instability. An endemic problem across the developed and developing world, corruption poses a major challenge to policy makers and governments worried about maintaining legitimacy. So how do we fight corruption? The answer is far from clear. As David Ondracka notes, you close one hole only to discover that two new ones have opened. 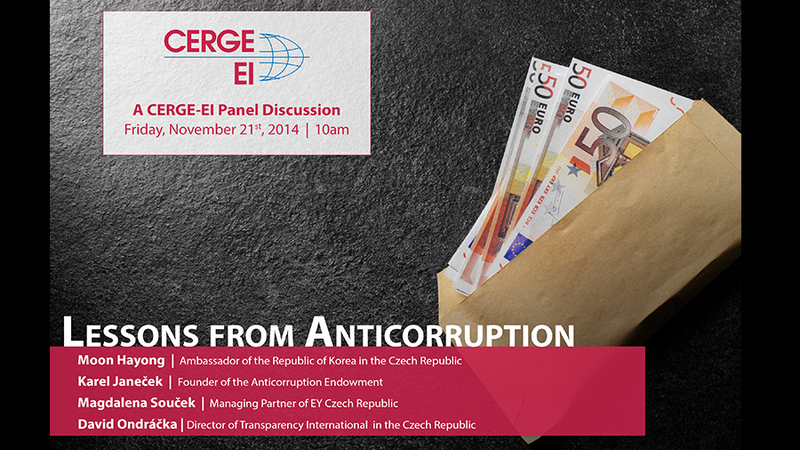 That’s why on Thursday, November 21st, leaders of government, civil society, and the private sector came together at CERGE-EI to discuss innovative anti-corruption solutions and lessons learned. 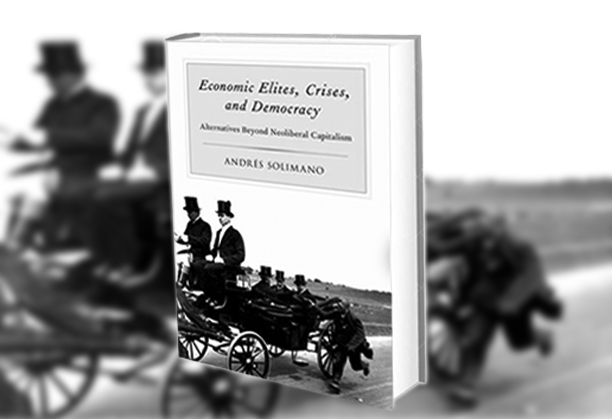 In his new book, ‘Economic Elites, Crises, and Democracy,’ Andrés Solimano thoughtfully examines the main challenges to global capitalism, including the rise of economic elites, the increased frequency of financial crises, and rising public discontent with the status-quo. 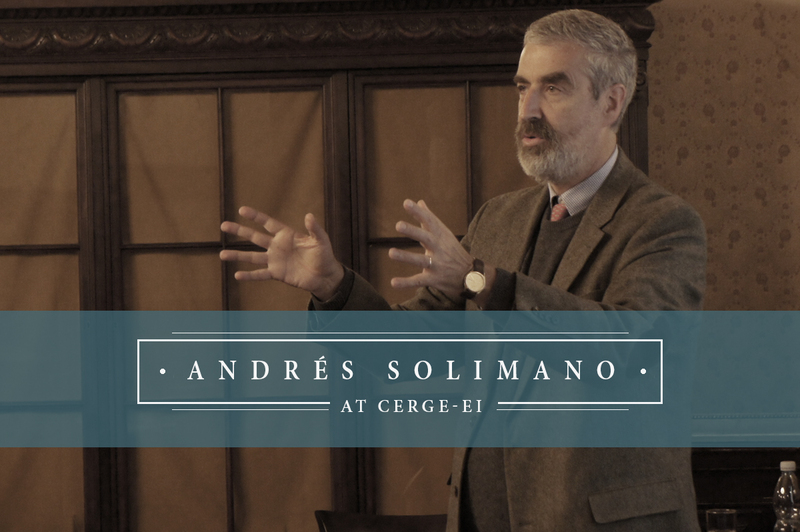 During his CERGE-EI visit on November 19th, Professor Solimano presented data showing the rise of rich economic elites and the fragmentation of the middle class. He warned that these trends, combined with the weakening of the traditional working class and marginalization of labor, are a common feature of capitalist societies all over the world and together constitute a major threat to the stability of the system. He also noted that financial crises have increased markedly since the 1980s, and have recently reached the ‘core’ economies of the world system. All this has led to fractionalization and public disenchantment with democracy, which manifests in social protests and the rise of extreme politics. Solimano forcefully argued that these trends threaten to undermine the global capitalist system unless new approaches are adopted in order to solve the world’s acute social problems. He briefly discussed potential approaches, including redistributional tax policies, reclaiming and redefining public ownership, and giving labor and the middle class more voice in austerity programs. Given the brief time available, Professor Salimano could not go into great detail about such an ambitious topic. Lucky for us, the detailed information can be found in his book, which is available for purchase here! 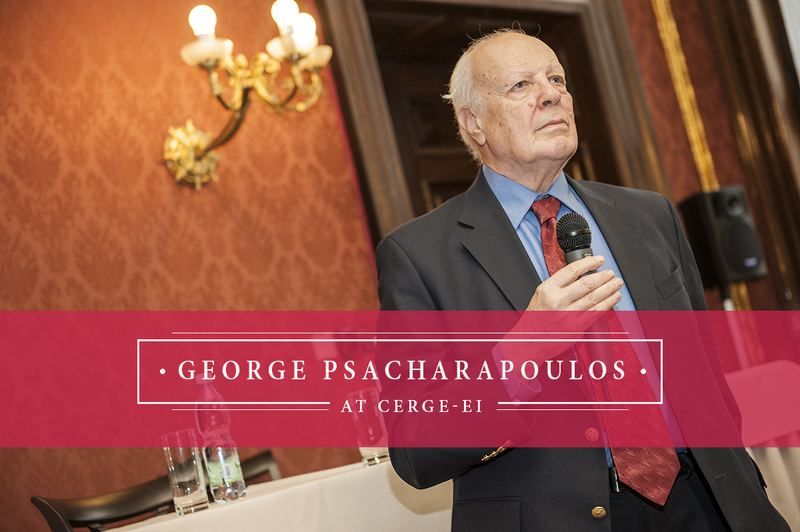 Over the course of his long career, George Psacharopoulos has made a deep impact on the way education is viewed from the perspective of economics. During his CERGE-EI Public Lecture on November 4th, Prof Psacharopoulos gave an interesting overview of the evolution of this research. He walked the audience through years of evolving theories and empirical evidence on the importance of education as both a personal and public investment, sharing a number of revealing facts and thoughtful insights. The CERGE-EI Foundation recently completed a generous grant made possible by the generous support of the American people through the United States Agency for International Development’s (USAID) the American Schools and Hospitals Abroad program (ASHA). ASHA provides assistance to schools, libraries, and medical centers outside the United States that serve as study and demonstration centers for American ideas and practices. ASHA’s grants help these institutions train future leaders in a wide variety of disciplines, support local and regional infrastructure to foster development, and cultivate positive relationships and mutual understanding among citizens of the United States and other nations. The grant was awarded to the CERGE-EI Foundation to support the world-class CERGE-EI library in Prague. The ASHA grant supported the purchase of library commodities such as books, manuscripts, and electronic resources including journal subscriptions and databases. The grant provided $400,000 over two years, from October 2012 until the end of September 2014. These resources are accessible to CERGE-EI students as well as all our affiliates and even the general public. With the help of ASHA, the CERGE-EI library is a crucial resource for researchers in economics and related fields who need full access to the best and most current knowledge in the field, as well as a large archive of previous publications. Investing in digital subscriptions and e-books has allowed the CERGE-EI library to extend its reach all over the world. 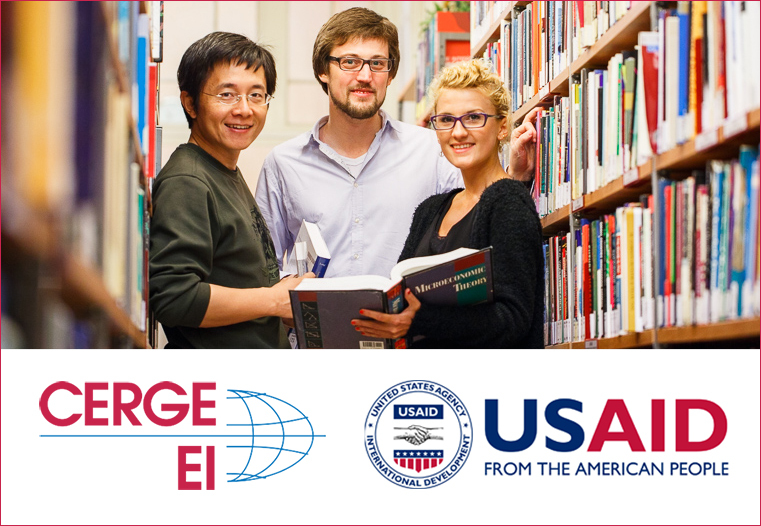 CERGE-EI is very grateful to ASHA, USAID, and the USA for their support of the library. With ASHA’s help, CERGE-EI is pushing forward with its mission to educate economists in modern economic theory, create an intellectual environment that emphasizes Western ideals of free and open inquiry, and serve as a model and resource for the reform of economic education and scholarship in the post-communist transition economies. The contents are the responsibility of CERGE-EI and the CERGE-EI Foundation and do not necessarily reflect the views of USAID or the United States Government. 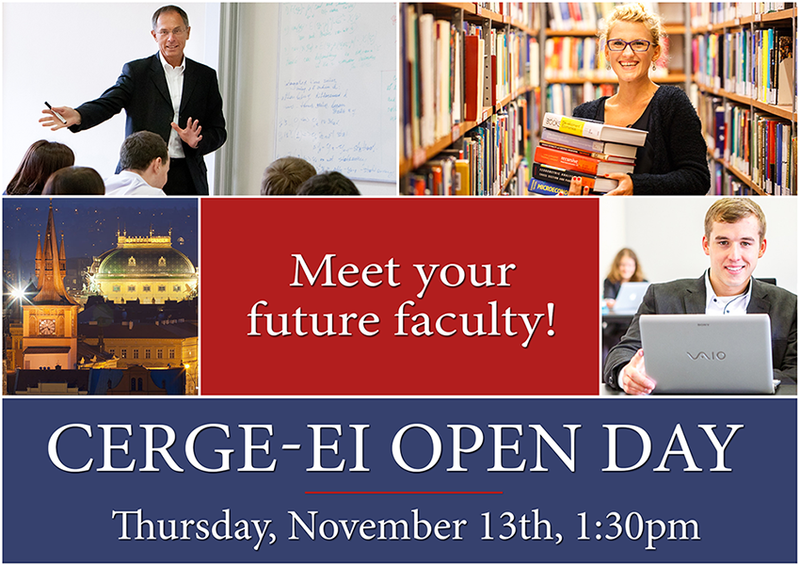 Open Day At CERGE-EI – Meet Your Future Faculty on Thursday, Nov. 13! Come to find out more about studying at CERGE-EI. Explore our campus in the center of Prague, meet your future faculty, get to know the students, and hear what alumni have to say about CERGE-EI enhancing their career. More details about Open Day are on the CERGE-EI website. The following article was written in Czech by Kateřina Surmanová for Hospodářské Noviny on September 29th. The original article can be found here. CERGE-EI maintains that it ranks among the best economic institutes in the world. 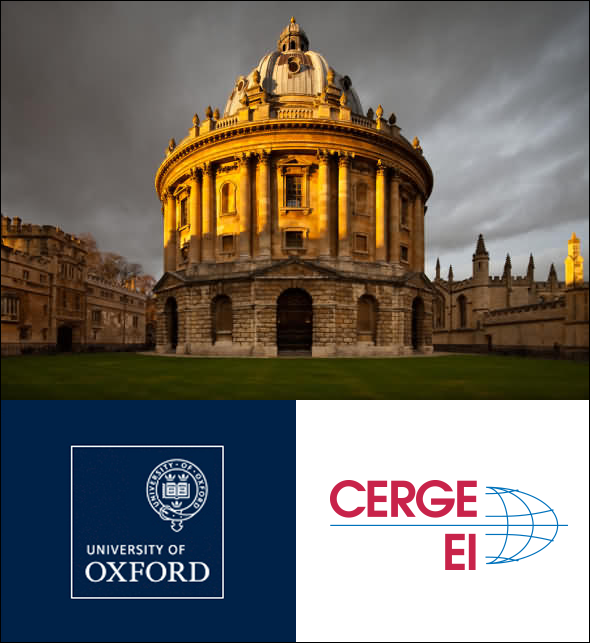 Recently CERGE-EI cooperated with Oxford University in organizing an academic conference focused on the connection between psychology and economics. The prestigious English university specifically requested CERGE-EI’s cooperation in organizing and participating in the conference, and CERGE-EI researchers were given the job of choosing who to invite. “It’s quite common for individuals to attend academic conferences abroad. 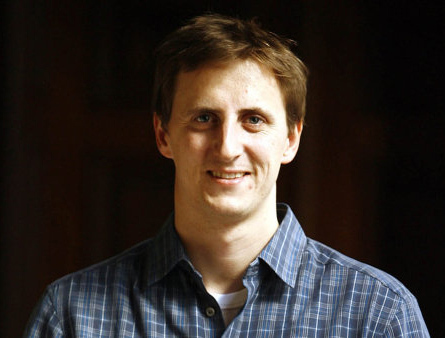 But for one institution to invite an entire other institution is quite an honor,” said Filip Matejka of CERGE-EI, who has been specializing in the special topic of the conference (the theory known as ‘Rational Inattention’) since his time as a PhD student at Princeton University. CERGE-EI already earned a good name for itself two years ago when it organized the first annual ‘Rational Inattention’ conference in Prague. Twenty top economists took part in that conference, including Christopher Sims, who is the 2011 winner of the Nobel Prize in Economic Sciences and a long-time research collaborator with Matejka. “We have managed to convince our international colleagues that we know how to organize a top-level conference and that we have research expertise in the field,” mentioned Matejka.